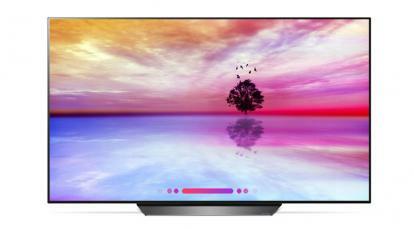 Update: it turns out that LG will also release a 65" OLEDG8. LG Electronics announced its 2018 OLED TV lineup. The company updated all of its models, except the OLEDG7 which will not get a successor in 2018. All the TVs are based on new a9 "intelligent processor" that promises better color and fast smart TV (webOS) operations - except the entry-level B8 which uses a scaled-down version of the chip. 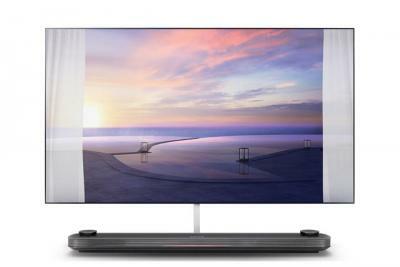 The OLEDW8 will be LG's flagship TV for this year, a wallpaper design OLED TV which attaches to the wall using magnets - with a thin cable that connects to the sound bar and interface box. Like all the rest of the TVs, the W8 will support Google's Assistant for natural language control, Dolby Atmos, HDR and 4K HFR (120Hz). The other new models are the OLED-on-glass OLEDE8, the basic OLEDC8 and the entry level OLEDB8. LGE did not reveal the price or release dates of these TVs, but hopefully we will have more information about LG's upcoming TVs next week from CES . That is a darn shame about the sound bar on the w8. I've been waiting for the wallpaper to not come with one. I already have a AVR and 7.2 speaker setup. I, along with many others, was hoping the LG would just use a small breakout box vs the sound bar. Of course the question is how much of the bar is really for sound. Maybe the wallpaper needs a huge breakout box... and if it is that big, they just throw in speakers. Either way.. this makes me sad. What options are there for the 77" then. If the G7 isn't getting an update... (88"?) I was looking forward to a 77" oled this year. But it might be worth waiting another year as it is unlikely we are going to see HDMI 2.1 in these units. HFR is just more fake 120fps, right? more crappy truemotion stuff..
Hello Jordan, for 77" you will have the 77OLEDC7, which will probably be quite lower in cost compared to the W7. is there any plans from LG (or any other company) to come out with a 70in OLED? that is the biggest oled i have room for. Best Buy personal swear that Sony's LED Z9D processes color better than Sony's 2017 OLED. They show a side by side demo and it appears they are correct. Has Sony made any improvements in this regard for there 2018 oled? Yep, such a shame about the stupid sound bar. Like people in this price point will want one. I just want the wallpaper TV with a breakout box.